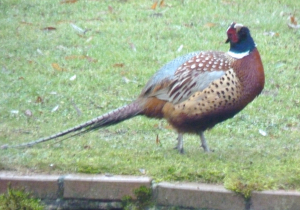 Observation - Pheasant in our garden - UK and Ireland. Description: Male pheasant taking advantage of food fallen from feeders. Not being native, they somehow look too exotic for the UK! In the past one has knocked on the window. Male pheasant taking advantage of food fallen from feeders. Not being native, they somehow look too exotic for the UK! In the past one has knocked on the window.